Gerald Arthur Stacey was a chartered accountant by profession. He joined the City of London Regiment as a volunteer in 1902 and was sent to France shortly after the war was declared. He became second in command of the battalion and was killed in The Battle of the Transloy Ridges when in temporary command of the battalion. He was mentioned in despatches and awarded the Distinguished Service Order and the Legion d’Honneur. Gerald Arthur Stacey was born at Leigh Place, Flanchford Road, Leigh, near Reigate in Surrey on 26 December 1881, the only son and eldest child of Arthur Stacey (1854–1886) and his wife, Gertrude Alma née Attenborough (1854–1935). Arthur Stacey was a gentleman farmer and married Gertrude Alma Attenborough at Reigate in late 1880. The couple’s first child, Gerald, was born on 26 December 1881, followed by two daughters, Dorothy born in early 1883 and Gladys Alma, born in July 1884. Gerald was baptised at St Bartholomew’s church in Leigh on 19 February 1882. Arthur Stacey died on 17 December 1886, shortly before Gerald’s fifth birthday. His mother re-married, to Frederick Crosley (1856–1932) at Brighton in mid-1892. At the time of the 1891 census, Gerald was lodging with Lewis Decker, a schoolmaster, at 45 High Street, Ramsgate in Kent. Ten years later, now an articled clerk, he was living with his mother and stepfather and two sisters at 22 Mowbray Road, Upper Norwood in south-east London. On 22 June 1907, at St Augustine’s church, Honor Oak Park in Sydenham, Kent, Gerald (aged 25) married 22-year old Annette Hope Neild (1884–1964). The couple’s first son, Gerald James Stacey, was born on 25 September 1907. Elizabeth Hope, born Sunbury on Thames, Middlesex in late 1908 and died in mid-1909. Mary Hope (known as Molly), born Sunbury on Thames in June 1910. Aileen Ada, born Ovingdean, Sussex in March 1912. Harry Arthur, born Newhaven, Sussex in May 1915. At the 1911 census, Gerald and Annette, together with their two older children, were living at Rectory Cottage in Ovingdean, near Brighton with two live-in staff, Norah Creed, a 23-year old nurse, and Edith Roberts, a 17-year old general servant. At the time of his death, his address was given as The Haven, Rottingdean. In 1900, aged 18, Gerald entered into articles with Charles James Singleton, F.C.A. at 8 Staple Inn, London WC. Singleton (1841–1918) was a friend and confidant to the American artist, James McNeill Whistler. In 1901, Singleton married his long-time mistress Agnes Hiffernan, the sister of Whistler’s former mistress, Joanna Hiffernan. Gerald passed his final accountancy examinations in May 1906, and was admitted as an Associate Member of the Institute of Chartered Accountants in August of that year. He commenced to practise in the spring of 1907, becoming second partner in the firm of Pridie, Stacey, Brewster & Trenchard of Crosby Buildings, Crosby Square, off Bishopsgate, London EC3. Gerald Stacey was initiated into Pelham Lodge No 1303, meeting at Lewes in Sussex, on 24 November 1911, passed to the second degree on 29 December and raised to the degree of master mason on 26 January 1912. In December 1913, he was elected as a joining member of Royal Rose Lodge No 2565, meeting in London, (where his cousin James Attenborough was a member) but appears never to have taken up his membership. Gerald’s principal, Charles James Singleton, was also a Freemason, having been initiated into South Middlesex Lodge No 858 in 1871. In May 1894, Singleton was a founder member of Fulham Lodge No 2512; his co-founders included Stanley James Attenborough, Gerald’s uncle. Gerald started his military career on 18 November 1902, when he was commissioned as a second lieutenant with the 2nd Volunteer Battalion, The Royal Fusiliers (City of London Regiment), and was promoted to captain on 25 February 1905. On 1 April 1908, the army was re-organised under the proposals of Lord Haldane and the battalion became the 2nd (City of London Battalion), The London Regiment (Royal Fusiliers), with Gerald retaining his rank as captain. As volunteers, the territorials were required to attend weekend training sessions at the battalion’s drill hall in Tufton Street in Westminster and annual fortnight-long training camps. On 2 August 1914, the battalion had travelled to their annual training camp near Wareham in Dorset. On reaching their camp, they received orders to return to London immediately, in view of the deteriorating political situation. They spent the night of 2/3 August at the battalion headquarters in Tufton Street, and the following day they were mobilised as part of the 1st London Infantry Brigade. At first, they were deputed to guard the port of Southampton and the railway line between there and the military bases on Salisbury Plain, being at their war station some 18 hours before war was officially declared. At this time, Captain Gerald Stacey was in command of ‘A’ Company stationed at Redbridge, near Southampton. The battalion remained in the Southampton area until the end of August, when they were recalled to London. As territorials, their engagement did not require them to serve outside the United Kingdom, so volunteers were called to serve overseas, to which nearly all the men and officers responded favourably. On 3 September, the battalion returned by train to Southampton where, the following day, they embarked on SS Nevasa bound for Malta. After an uneventful voyage, they reached Valletta on 13 September, disembarking the following day to take up duties at Floriana Barracks, relieving the 2nd Battalion, Middlesex Regiment, in defence of the town and port of Valetta. As well as guarding the town, the battalion spent the next few months in intensive training at the racecourse at nearby Marsa. On 30 September, the battalion’s commanding officer, Lieut-Colonel E.L. Marler, suffered a serious injury and left the battalion to return to England, following which Gerald’s cousin, James Attenborough, assumed command of the battalion, with Gerald Stacey as his second-in-command. The battalion history records that the battalion enjoyed their short spell on Malta, and spent an enjoyable Christmas there before being plunged into the full horrors of the war. On 1 January 1915, the battalion left Malta on board the SS Neuralia with sealed orders. Although the men had been anticipating a return to Britain for a spell of leave, they were dismayed to find that their orders were to proceed to Marseille, where they arrived after a very rough passage on 5 January. The men were ordered to remain on board, while the officers disembarked to visit the city, which was at that time the base of Indian troops. The following day, the men disembarked and boarded trains bound for the north of France. After a tedious journey via Paris, the battalion reached Etaples on the northern coast on the cold, wet afternoon of 8 January. No accommodation was available at Etaples and the battalion were forced to pitch their tents in the rain and rapidly approaching darkness. After a few days training in the sandhills on the coast, the battalion moved 65km north-east to Arques, near St Omer where they underwent a ‘very strenuous course of training’ in ‘open warfare’ with occasional training in trench construction. The training concluded on 19 February when the battalion marched over three days to Armentières, 45km east of Arques, where they joined the 17th Infantry Brigade, 6th Division where they came under the guidance of the regular 1st Battalion of the Royal Fusiliers who introduced them to the ‘realities of war’. At Armentières, the 1/2 Londons provided working parties just behind the lines, before being instructed in the details of trench warfare. During the time at Armentières, the weather was bad with heavy rain, and the River Lys regularly overflowed its banks, flooding the trenches. Their first engagement with the enemy came on 11 March 1915, when the 1/2 Londons supported the 2nd Leinster and the 1st North Staffordshire Regiments in the capture of L’Epinette, (4km east of Armentières) in which they suffered the loss of nine men killed and sixteen wounded. On 21 April, Gerald Stacey was promoted to the rank of (temporary) major. The battalion remained in the vicinity of Armentières until early June 1915, with time in the front line, with occasional contact with the enemy, alternating with periods training behind the lines. On 3 June, the 1/2 Londons left Armentières and marched to Bailleul, moving on to Poperinghe in Flanders the following day, a total of 30km north. After a few days’ rest, they moved 15km east to the Wieltje sector (to the north-east of Ypres) before moving up to the Yser canal where they remained until 25 June. Once again, the weather was atrocious and the trenches would constantly collapse with the rain. During the next six weeks, the battalion spent periods in and out of the front line trenches around Wieltje and La Brique. In July 1915, Gerald Stacey received a slight arm wound, necessitating a short rest in hospital. On 10 August, the 17th Brigade were ordered to take over the front line at Hooge (4km east of Ypres on the Menin road) which had been re-taken from the enemy. For the next two weeks, the battalion was under heavy fire during the day but spent every night consolidating the lines, repairing trenches etc. They also recovered and buried the bodies of men, both British and German, who had fallen in the battle to reclaim the front line. 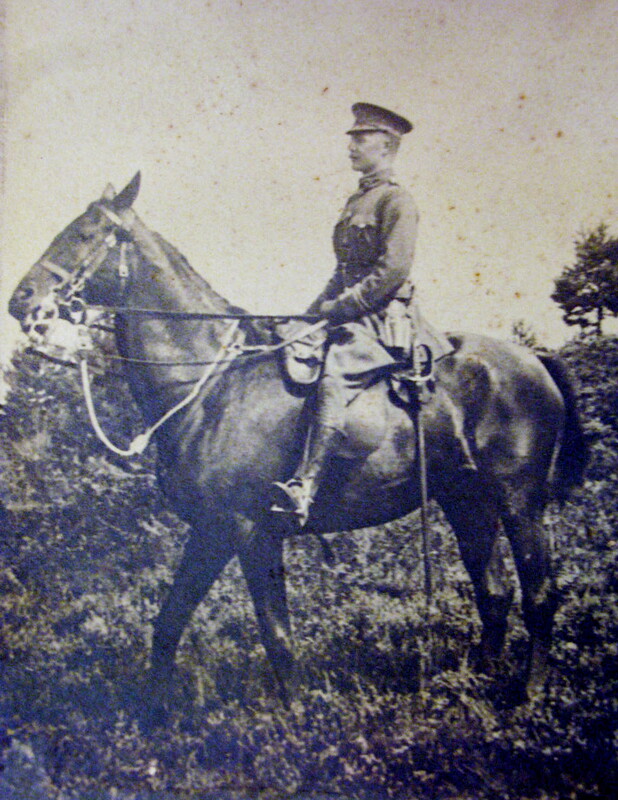 Major Gerald Stacey had the trying and difficult task of identifying the bodies of the British officers killed in the earlier fighting in Sanctuary Wood. The battalion spent September and early October back in the trenches at La Brique – yet again, the weather was appallingly bad and the trenches were waterlogged and in a terrible condition. On 14 October, the 17th Brigade (including the 1/2 Londons) was transferred to the 24th Division and moved south of Ypres. After a spell on Hill 62, where the lines were less than 100m apart, the 1/2 Londons left the front line for a few days’ rest in the safety of Reningelst, south of Poperinge. On 26 October, the 1/2 Londons moved to a rise in the ground known as ‘The Bluff’ near St Eloi. The Bluff was a mound created from a spoil heap during the digging of the Ypres–Comines Canal before the war. Although of modest height, The Bluff was of great strategic importance, as it commanded the low lying ground between Ypres and St Eloi. The trenches and defence works were in a very bad condition because of the weather with mud up to a metre deep in some trenches. As a result, men would move about in the open, running the risk of being shot by sniper fire or falling off the duckboards into the mud, needing to be rescued by his pals. During this period, the battalion C.O., Lt. Col. Attenborough was absent in hospital and then on leave, with Major Gerald Stacey taking command. After 26 difficult days at The Bluff, during which 10 men were killed and 25 injured, the 1/2 Londons were relieved by the 10th Royal Welch Fusiliers. On 22 November, the 1/2 Londons left the front for their first sustained period of rest since joining the 17th Brigade in February. They marched for the next five days a distance of 72km to the tiny village of Recques-sur-Hem, south-east of Calais, where they remained until early January. As most of the battalion had been serving continuously since the start of the war, leave was granted to all those who had not returned home for over a year. The battalion spent the six weeks in training in the art of ‘modern warfare’ including musketry, attack practice, bombing and drill, and in trench construction. Christmas Day 1915 was celebrated in ‘magnificent fashion’ with roast pork and Christmas pudding (one per man supplied by The Daily Express). Having been mentioned in dispatches on 30 November 1915, Major Gerald Stacey was awarded the Distinguished Service Order in the 1916 New Year’s Honours. On 24 February, he was awarded the Legion d’Honneur by the President of the French Republic, Raymond Poincaré. On 7 January 1916, the battalion returned to Flanders, where they were held in reserve until 9 February, when they were transferred to the newly formed 56th (1st London) Division, becoming part of 169th Infantry Brigade. The 1/2 Londons travelled by train from Poperinghe to Pont Remy, near Abbeville, in northern France from where they marched 13km south-west to Doudelainville, where the war diary reports that the villagers were ‘somewhat unfriendly’. The newly formed division spent the next three months in organizing itself into a cohesive unit, with further training in gas, machine guns, trench mortars etc., firstly around Pont Remy before moving 45km north-east to Séricourt, described as a ‘pleasant enough village’, although the billets were in a filthy condition. The weather in mid-April was again atrocious and for nearly a fortnight, training was seriously interrupted by continuous rain. Once the 56th Division had been ‘shaken together’, they were moved south, with the 1/2 Londons marching on 7 May, 22km to Halloy (east of Doullens) where they were billeted for ten days before moving 12km east to Souastres. The battalion spent much of the month leading up to the planned assault on the German lines in the Somme supplying working parties for the construction of roads and light railways, and burying communication cables. On 30 June 1916, the battalion were deployed in reserve supporting the rest of the 169th Brigade as they planned to assault the heavily reinforced German lines in the Gommecourt Salient. At 7.25am on 1 July, the brigade launched its attack on the enemy lines. Despite some early successes and limited gains, the British were unable to hold these against overwhelming odds, and were forced to withdraw, incurring heavy casualties. At 1:30pm, the 1/2 London Battalion were ordered to attack the trenches just south of Gommecourt. They soon came under heavy machine gun fire suffering dreadful casualties and after several hours of intense fighting, the British admitted defeat and withdrew. On 1 July 1916, the battalion lost six officers killed and six wounded, with 41 men being killed, 158 wounded and another 42 missing, most of whom would subsequently be reported killed. Altogether, the British forces suffered 57,470 casualties, including 19,240 fatalities, on the first day of the Battle of the Somme, the bloodiest day in the history of the British Army. They gained just three square miles of territory. The depleted 1/2 London Battalion were initially withdrawn from the front lines but were soon back in the trenches. The rain continued to fall heavily and the trenches, which had been badly damaged in the battle became flooded, with men being forced to swim at times to move about. On 11 July, the battalion was reinforced by a draft of 71 NCOs and men, although many of these were not Londoners. Early August was spent either in reserve at Bienvillers or in the trenches at Hannescamps, before being withdrawn on 18 August, when they marched 20km north-west to Ivergny. After a stay of three days, they marched 50km further west in two days, reaching Canchy close to Abbeville on 23 August. For the next fortnight, the battalion were officially at rest, but in reality they continued to train hard. On 26 August, the 56th Division took part in the first demonstration in France of a new weapon, the tank. 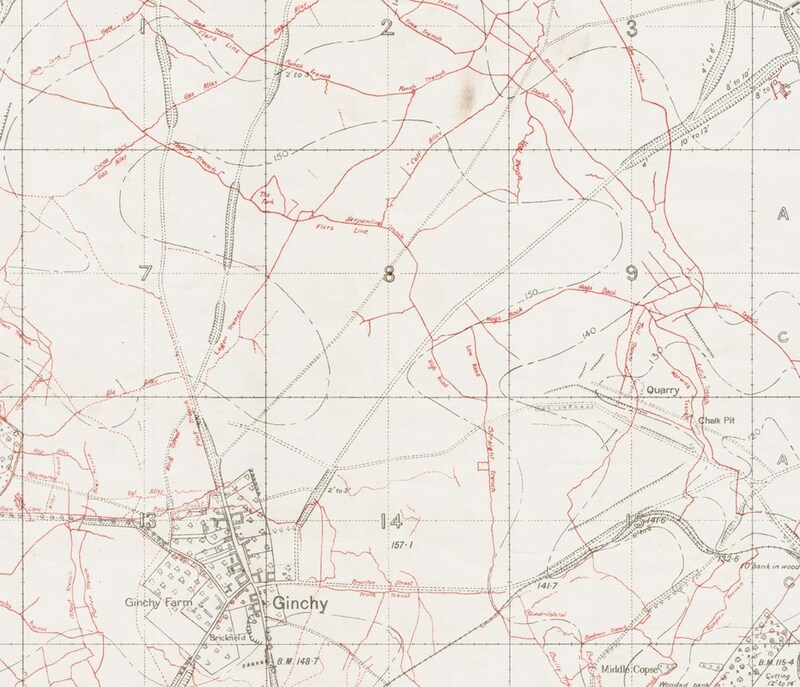 With their rest over, on 3 September the battalion together with the rest of the 169th Brigade were taken by train 54km south-east to Corbie, situated at the confluence of the Somme and Ancre rivers, and from there marched 33km through the devastated lands just behind the front line to the remains of Fallefont Farm, close to the front line at Combles. No sooner had they arrived when they were plunged into the battle to capture Combles. After several days in attempts by the brigade to capture the strategic Leuze Wood (known to the British soldiers as ‘Lousy Wood’), on 10 September, two companies of the 1/2 Londons were ordered forward in a vain attempt to capture the trenches in the wood, resulting in the deaths of four officers and 23 other ranks, with a further four officers and 91 men wounded and 19 men missing. On 15 September, the brigade renewed their attempt to take Combles and eventually succeeded in reaching the ‘sunken road’ from Leuze Wood down to Combles. Once again, casualties were high with four officers and ten other ranks killed, three officers and 19 other ranks wounded and 251 men missing, many of whom were killed. After further heavy fighting, Combles was eventually captured on 25 September, following which the battalion was relieved and marched 18km to Méaulte, described as ‘a depressing little town near the Ancre’. On arriving at Méaulte, after three weeks in the front line in which they had taken part in some very severe fighting in dreadful weather, the 56th Division were looking forward to some rest, but after only one day, they were ordered back to the trenches on 29 September. On the evening of 30 September, they relieved the 9th Norfolk Regiment at Serpentine Trench in the Flers line, midway between Ginchy and Lesboeufs. 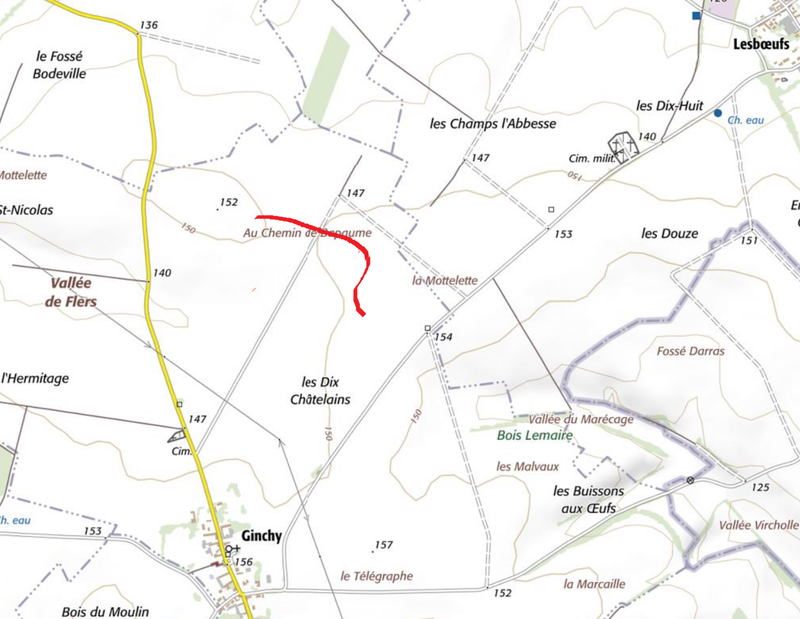 The battalion spent the first week of October in the reserve trenches at Trônes and Bernafay Woods, or in the front line trenches to the east of Lesboeufs, where they frequently came under fire from the enemy artillery at Le Transloy. On 7 October 1916, the 56th Division launched their attack on the German lines at Le Transloy. As Lt-Col James Attenborough was on leave, visiting his brother Bernard who was in hospital having been wounded at Leuze Wood on 10 September, Major Gerald Stacey took command of the battalion. At 8:30 am on 8 October, the 1/2 London Battalion moved into Serpentine Trench, where Major Stacey established his headquarters. Nothing further happened that day, and at 10.00 am on 9 October, the battalion were ordered back to the reserve trenches. During the evacuation, the German artillery launched a bombardment on a battery immediately to the rear of the trench. Unfortunately, the range of the enemy shells was short, and they fell into the trench, killing Major Stacey and four other ranks. At 10:15, the orders to withdraw were cancelled and the battalion was recalled to the Flers line, where it remained until relieved at 4:00 pm. The loss to the 1/2nd Londons of Major Gerald Stacey, D.S.O., was a very serious one. He was a keen and fearless officer, and he was popular with all ranks. We regret to have to record the death of Major Gerald Arthur Stacey, D.S.O., 2nd City of London Fusiliers, who was killed in action in France on the 11th ult(sic). As an officer he enjoyed much popularity amongst his colleagues, and had the full confidence and trust of his men. By those in authority he was considered a thoroughly competent leader and an officer full of promise. Gerald Stacey was buried at Guillemont Road Cemetery (grave reference I.D.1) approximately 4km from where he was killed. In a neighbouring grave is buried Lieutenant Raymond Asquith, the son of the British Prime Minister, Herbert Asquith, who was killed near Ginchy on 15 September 1916, at the Battle of Flers-Courcelette. Gerald is commemorated on the war memorial at Rottingdean, close to his family home. Gerald’s widow, Annette remained in the Rottingdean area until her death on 22 August 1964, aged 79. The younger son, Harry Arthur Stacey was serving as a lieutenant in The Royal Navy when he was drowned in the sinking of H.M. Submarine Swordfish on 7 November 1940. Gerald James Stacey, died in Northern Rhodesia in 1952, and Aileen died in New South Wales in December 2013, aged 101. Their sister, Molly, married Hugh Trevanion in 1937 and celebrated her 107th birthday in June 2017. WO 374/64686 Major Gerald Arthur Stacey. The London Regiment. The photograph of Gerald Arthur Stacey is owned and provided by the kind courtesy of Mary Hope Trevanion.